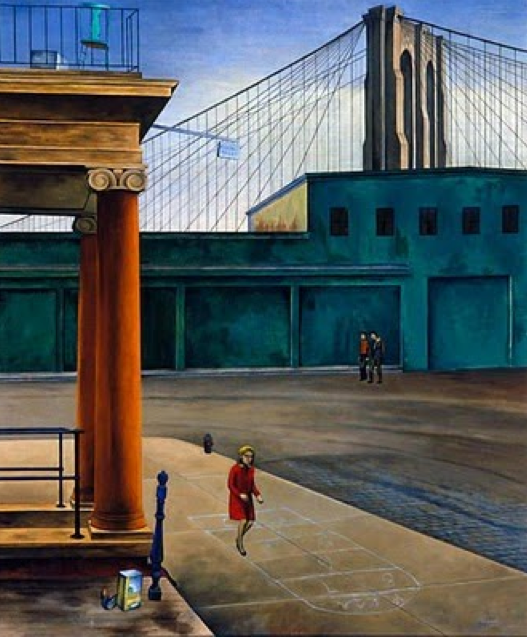 South Street was a still and empty place of tenement dwellers overshadowed by the Brooklyn Bridge in “South Street Stoop,” painted in 1935 by O. Louis Guglielmi. “[Guglielmi’s] dreamlike works were critical commentaries on the social injustices of capitalism,” states Bruce Weber, author of Paintings in New York. This entry was posted on October 26, 2015 at 6:00 am and is filed under Lower Manhattan, Music. You can follow any responses to this entry through the RSS 2.0 feed. You can leave a response, or trackback from your own site. Gugliemi seems to have been under the influence of his contemporary Giorgio De Chirico whose works two decades earlier such as the “Enigma of the Hour” and empty streetscapes such as “gare Monteparnesse the Melancholy of Departure,” were present at the MoMA and Met respectively and would have provided an identity for and expat Italian. The class disparity that Weber alludes to may have been secondary to the identification with alienation. And the contrast between the filigree of this Brooklyn Bridge and the vital brutality of Joseph Stella’s rendition notable. The ionic columns on the docks of the South Street Seaport or Lower East Side are the most surreal element of the tableau, interesting if it was in fact a reference to a leave behind of the earlier era when mansions still dotted this stretch at least along the heights. Italians of Guliemi’s generation populated not Harlem proper, but what became known as Spanish Harlem up at 114th Street and the East Side. Alienation is certainly the theme here. I had never seen Guglielmi’s work until this weekend and knew nothing about him. Thanks for the info. Exactly. Hopper. Also,there’s a story being told, a la Endara Crow. Magical Realism NYC. The lady in red appears to be hovering. The little girl is suspended in the air playing hop-scotch. As a child the familiar chalk diagrams of the hopscotch grid would appear on the sidewalks and asphalt of every neighborhood where children were to be found.